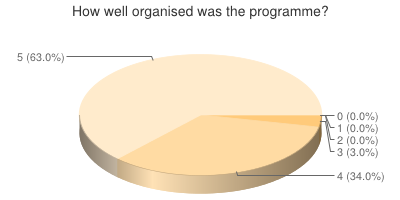 We also had a bit more detailed questions about our audience this year. 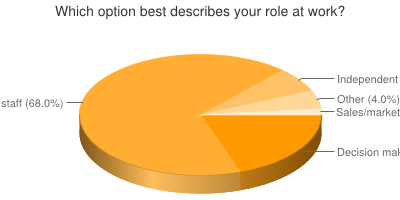 It is interesting to see that about half the attendees consider themselves primarily application developers, with "only" 28% seeing themselves as primarily DBAs. While we try to mix our schedule to fit both these groups (and others), this may be an interesting signal for those who are going to submit talks for next years conference. I also find it interesting to know that as many as 20% of our attendees have the role of decision maker in their organization. 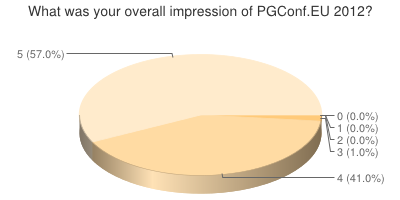 It's hardly surprising that 68% are in the role of engineering/technical staff, but this is a clear sign that pgconf.eu has grown to be much more than just a meet-up for developers. 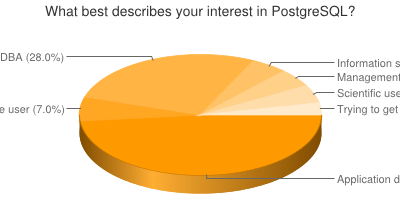 Many of people enjoy the valuable "hallway track", and speakers and fellow attendees who "actually know something about the PostgreSQL"
The skill-level rating on some talks were off. This is something that's submitted by the speaker, and maybe we need to find a process for reviewing and adjusting these. Several people complained about the lack of amplifiers in two of the rooms on Wednesday. This was fixed by Thursday morning, and we do apologize for the problems it caused on Wednesday. Likewise for air conditioning in the rooms, until the hotel staff managed to adjust it for better performance. Availability of coffee and water only during the breaks. For next year, we are definitely going to look into an option that allows us to provide this all day and not just during the coffee breaks - but ultimately, it's a matter of cost. Naturally, the speakers are at the very core of the conference content, and we're very happy to be able to attract such a great crew of speakers. Not a single speaker scored less than 4 when it came to speaker knowledge - regardless of the level their talk was given at. 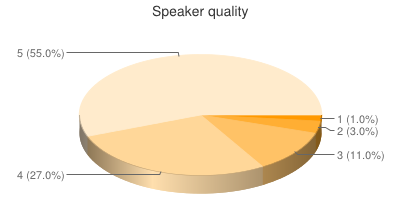 A few speakers scored a bit lower when it came to quality, but still the general quality level was pretty high. And hopefully the knowledge of the speaker made up for the lack of speaking experience/skills in the few cases where those scored low. So a big thanks to all our speakers for helping us keep a high level! For those of you who've seen this blog post from me after previous years, you know that there are a couple of toplists to come. This is the first year when we had multiple speakers for the same session in several different sessions. It's worth noting that out feedback system has no way to give separate feedback to these speakers, so the score can be considered an average between the two speakers. This is something we should perhaps look into improving for next year. That's all for now! We also had a lot of feedback questions about what to do next year, something I will follow up in a separate blog post soon.